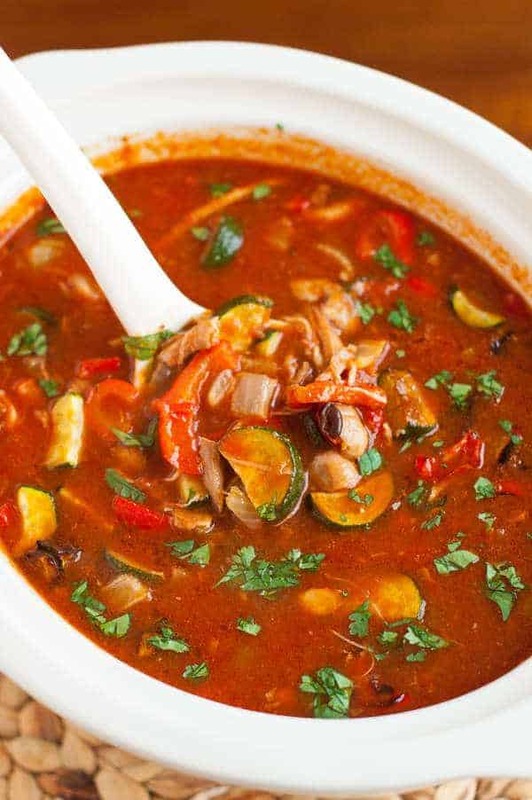 This is the best gluten-free healthy chicken tortilla soup recipe. It is a staple in my house. I love how it can just simmer away and develop its deep, rich flavor while I get stuff done. 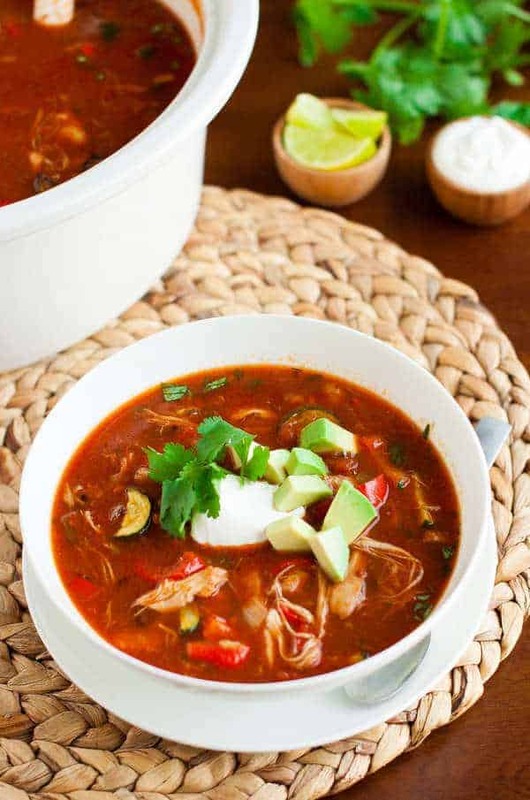 This healthy chicken tortilla soup recipe is a staple in my house. It’s a good meal to make for those with food intolerances because it can easily be adapted for those on different diets. It can just simmer away on your stove top or in your crockpot and it has such a deep, rich flavor. I started with cooking bone-in chicken thighs in crushed tomatoes in spices for several hours until tender. This way you get the most tender chicken and the most flavor out of it because of the bones. The chicken is taken out, bones removed, shredded and added back in with black beans, chicken broth and oven roasted veggies. The broth for this was SO rich and had such a nice body to it. The oven-roasted veggies add great depth of flavor. This version calls for bone-in chicken thighs, but if you want less work (and less flavor), you could just use boneless chicken thighs. For more flavor, use bone-in chicken thighs with the skins and take the skins off at the end. My all-time favorite brand of chicken thighs is Rosie’s. They are sooo good cooked in the crock pot all day. Alternately, when I forget to start the crock pot, I just cook the soup on my stove top for as long as I can, like a half hour or hour until the thighs are tender. I get the base started cooking and then work on the veggies and by the time they are done roasting in the oven, the soup base is usually done. 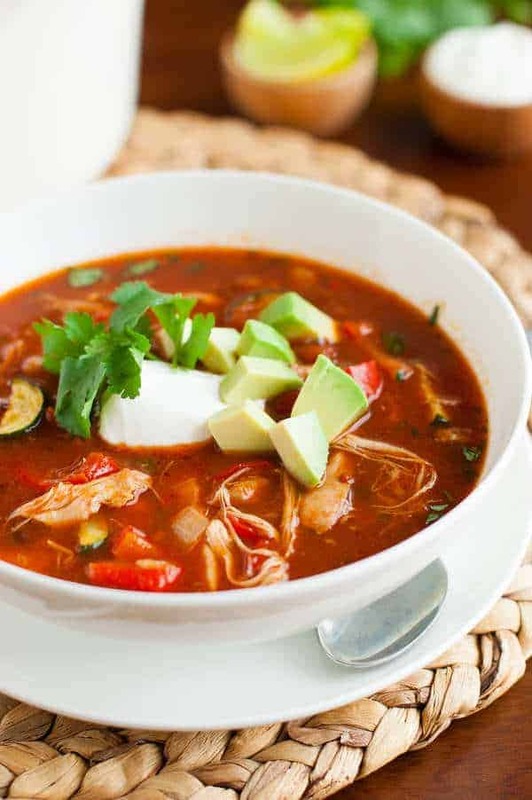 To make this healthy chicken tortilla soup recipe Paleo, just omit the black beans and the non-Paleo toppings. If you don’t do dairy, just use dairy-free sour cream, add extra avocados or forget the sour cream. This is a good example of a dish you could make for everyone in your house and they can choose the toppings according to their dietary restrictions and preferences. Because of this, it makes a good meal for feeding a group too. So, I’m going to “stand on my soapbox” for a while. I’m sick of soup being thought of as a winter food. I’m even more sick of people thinking of crock pots as more of a winter thing. What can be better than not heating up your entire house turning on the oven? Well, ok, maybe a grill outside while you’re sweating from the hot flames comes to mind. But, really a crock pot can simmer away all day, not heat up your house and it can be ready for you when you come home at the end of a long day of having fun. I don’t know about you, but I tend to eat out more in the summer since we’re out and about and tired and getting home just in time to eat dinner. It feels so good to know that you have dinner ready when you get home. It can easily be made in the crockpot by throwing all the ingredients in a crockpot and cooking on low for 8 hours or high for 4 hours. Chicken thighs are much better for this though since they can’t be overcooked. Sometimes I even use chicken thighs with the bones and skin and at the end take each piece out and take out the bones and skin. The soup tastes so good this way. You can make it even faster and easier by using a store-bought rotisserie chicken or cooking your chicken ahead of time and freezing it. Just throw the frozen block right in the soup. I like to make extras of this and freeze it in containers like this and then send them to work with my husband. So much healthier and tasty than the cans of soup he used to eat. A lot of people add corn to their soup. I consider corn a grain and try to eat as little of it as possible, so I leave it out. Plus, it’s hard to find non-GMO corn for the Clean Eating diet. This would go really well with some fresh, organic corn on the cob though. . .
You can substitute the red bell pepper with green pepper or jalapenos, or all of the above. I usually add a generous amount of cayenne pepper and some Tabasco, but not everyone likes spicy so I left it out of the main recipe. I often throw in some summer squash in addition to or instead of the zucchini. I shop at Costco a lot and they don’t have crushed tomatoes, so I usually just blend the diced tomatoes. It’s better really because I don’t like the occasional piece of tomato and sometimes crushed tomatoes have things added to them. This healthy tortilla soup really is healthy. It’s made with good clean wholesome ingredients. I really like making soup because I think it’s fun to dump stuff into a big pot. Our whole family LOVES this healthy chicken tortilla soup recipe – it is a huge hit in our home. It has a lot of flavors and is perfect for any time of year. I love how I can get a healthy, satisfying dinner on the table in 30 minutes and everyone likes it. I really like this chicken tortilla soup because you don’t even have to cook the chicken first. To a large dutch or stockpot, add oil and heat on medium-low. Add the onion, peppers, zucchinis, jalapeños, etc. and cook for about 5 minutes, until the vegetables begin to soften. Add the garlic and saute for 1-2 minutes. Bring to a boil and cook for about 20 minutes, or until the chicken is cooked and the vegetables are all soft. Just before serving, add the chopped cilantro and check seasonings. Add more salt and pepper if desired. Yes! I make extra on purpose and freeze it quite a bit. So good to heat up in a saucepan. Almost tastes better heated up than originally. I made the Gluten-Free Crock Pot Chicken Tortilla Soup and LOVED IT!!! This was by far the best soup I have ever made. Roasting the veggies gave it such a bold flavor I couldn’t believe it. I don’t like overly spicy food so I tweaked it just a little. I cut the spices by 1/3 and instead of using a 4oz can of green chilies I added one can of Rotel diced tomatoes w/green chilies. For me that balanced the flavors enough to enjoy every bite. I will definitely make this soup again. Thank you so much for posting the recipe. I’m so glad you tried roasting the veggies! I know it seems like it’s not really necessary but really gives it such a deep, bold flavor without being spicy that you can’t get any other way. And thanks for the suggestions for bringing down the spices. I’m sure some other people will appreciate knowing how to do that. Great recipe, easy to make and delicious, thank you! I would say that totally depends on how big your servings are, but since it has 4 chicken thighs, I would say about 4 regular adult servings if that’s your main meal. This looks so yummy and very tasty. Thanks for sharing over at the Snickerdoodle Sunday. 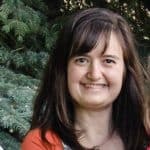 You have such great recipes on your site! Thanks for sharing them! You are welcome! I am glad you like them! This soup looks so yummy! Thanks for sharing it on Show Me Saturday! That sounds and looks fantastic. Thanks for sharing at my #RealFoodRecipes Roundup! I love tortilla soup, thanks for the recipe! I love Tortilla soup, thanks for the recipie.